On August 7, at the Naha Branch of the Mizuho Bank, children handled a bundle of notes worth 100 million yen to get an idea of its weight. On August 7, in Naha branch of the Mizuho Bank held what they called a Children’s Summer School featuring enjoyable quizzes and games to give 12 elementary school and junior high school pupils an idea of what working in a bank is like. 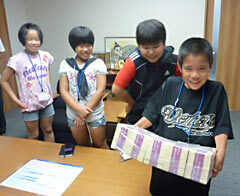 The children each handled a bundle of notes to the value of 100 million yen to feel how heavy it is. They now have a better understanding of what like to work in a bank thanks to experiencing some aspects of the work involved and seeing the inside of a bank.